Create a luscious lather naturally! Herbal bar soaps nourish and help protect your skin, leaving it feeling refreshed and velvety smooth. Best of all, they do not contain harsh detergents, such as sulfates, that can irritate, strip or dehydrate. Compare and shop for natural herbal bar soap or ... find out how safe your bar soap is with our product ingredient review. Treat your body right and avoid the toxins! Naturally keep your skin hydrated and clean with an herbal bar soap! Many commercial soaps can contain a variety of toxic and potentially harmful ingredients which may result in eye and skin irritations, allergic reactions and skin rashes ... Some ingredients are even known to cause cancer or other serious health conditions! ﻿Uplifting and skin softening, this moisturizing nutritive soap has a rich exotic aroma of a blend of vanilla, sandalwood and patchouli. Perfect for sensitive skin, and the ideal way to gently cleanse and moisturize for all skin types.Beautiful, simple and good for your skin. Just one of the assortment of fine handmade soaps in this collection! Read More or ... Buy It Now! They leave you feeling and smelling fabulous, and will NOT leave your skin full of toxic invaders! Most conventional bar soaps can contain perfumes, synthetic FD&C dyes, mineral oil and other petroleum-based chemicals that can clog pores, irritate and dry your skin. They also may include harmful ingredients such as antibacterial chemicals, ammonia, formaldehyde, propylene glycol (a neurotoxin, known to cause contact dermatitis, kidney damage and liver abnormalities), phenol, BHA/BHT and hormone disrupting parabens. Note: The majority of liquid soaps and close to half of bar soaps now contain anti-bacterials. In addition to being unnecessary, they expose us to harmful chemicals. The two most commonly used anti-bacterial chemicals are triclosan (a suspected immunotoxicant, suspected skin or sense organ toxicant, and creates dioxin (a carcinogen) as a by-product) and chloroxylenol - or PCMX (a suspected immunotoxicant and skin or sense organ toxicant, as well as a gastrointestinal or liver toxicant). Anti-bacterial soaps and cleaners kill both beneficial and harmful bacteria. By killing the beneficial ones, they actually leave us more vulnerable to the harmful ones we encounter. Children especially need exposure to some germs, to develop their immune systems. Scientists are concerned that the widespread use of anti-bacterials contributes to the development of resistant bacteria which will need stronger doses of chemicals to eliminate. So when we need to kill harmful bacteria, like strep, staph and e-coli, it will be more difficult. Anti-bacterial soaps may be more irritating and drying to skin. The US Center for Disease Control says that anti-bacterial soaps are not necessary. They recommend that the simplest and most effective thing people can do to reduce the spread of infectious disease is to use effective hand washing, especially after using the bathroom and before preparing or eating food. Proper hand washing means rubbing hands under running water for at least 15 seconds. How Safe Are Your Bar Soaps? 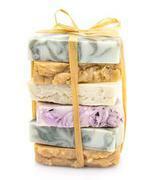 Keep it simple and safe with all Natural Herbal Bar Soaps and look and feel fabulous! Choose Organic Bar Soap Products, because you ARE worth it!